If you'd flipped through South Africa's Sunday Times in late February, you might have noticed a full-page ad by Kulula, a local budget airline. Designed to draw attention to cheap fares on offer this summer, the ad was bordered by hand-drawn images of soccer balls and a stadium. 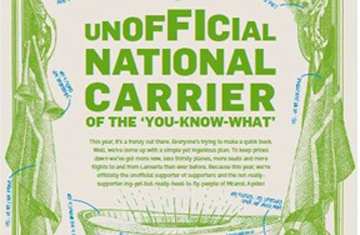 "Unofficial National Carrier of the 'You-Know-What,'" the airline boasted in large print. While it made no explicit reference to the World Cup, which kicks off in South Africa on June 11, the link was pretty clear. FIFA, soccer's governing body, wasn't amused. The ad created a clear association to the tournament, "which contravenes South African legislation," Miguel Portela, a FIFA lawyer, told TIME. After receiving a complaint from FIFA, Kulula promptly dropped the ad. Ambush marketing, through which companies try to associate themselves with an event without paying to be an official sponsor, has long been a fixture of the sporting world. At the 1984 Olympics in Los Angeles, Nike upset official backer Converse by erecting murals of its sponsored athletes in locations that were visible from within the main stadium. But sports authorities have struck back in recent years as sponsorships have become crucial to staging high-profile events. Commercial partnerships with the likes of Coca-Cola and Samsung, for instance, now bring in about 40% of Olympic revenues. Shielding official backers  and the boost to their brand recognition they expect from being associated with a popular event  is therefore vital. So with firms putting $44.8 billion into sponsorships in 2009, 18% more than in 2007, is ambush marketing becoming harder to pull off? Legal defenses have certainly been sharpened. Kulula's ad, for instance, broke a local ambush-marketing law introduced in time for the 2003 Cricket World Cup, Portela says, an event South Africa also hosted. In many cases, nonsponsors can also forget about plastering events' host cities in ads. After Nike upstaged official sponsor Reebok at the 1996 Olympic Games by covering Atlanta with billboards, the International Olympic Committee called time on the practice. The result: the organizers of the 2012 Olympics in London have been required to make sure legislation is put in place to help secure key advertising sites  from city-center billboards to spots at the major airports and train stations  for the use of official sponsors. FIFA, which doesn't have the same kind of control over the ad space in cities, has requested that future World Cup hosts not sanction additional ads, "especially high-impact ones like building wraps or wall covers," says Portela. "We wouldn't like ... World Cup fans being targeted by commercial messages at every corner." And certainly not in the event's Commercial Restriction Zones. Under local bylaws introduced for this summer's World Cup, all promotional and marketing activity will be prohibited in a roughly one-kilometer radius around South Africa's stadiums  even for official sponsors. A similar rule was enacted during the 2006 World Cup in Germany  as well as by previous Olympic hosts  catching both marketers and spectators by surprise. For example, officials ordered Dutch fans arriving at a World Cup match in Germany to remove their orange lederhosen supplied by Bavaria, a Dutch brewer. (U.S. rival Budweiser was among the official sponsors.) Without a change of clothes, many ended up watching the game in their underwear. Controls on advertising, though, can only go so far. At last year's British Open golf tournament, says Simon Chadwick, a professor of sport business strategy and marketing at Coventry University, luxury label Boss scored some free publicity by sailing a branded yacht in the sea alongside the event's coastal course, in full view of spectators. "There was nothing in the law to prevent them doing that," Chadwick says. Others are finding subtler ways to associate themselves with an event. Before the Beijing Olympics in 2008, Pepsi  whose fierce rival Coca-Cola was an official sponsor  painted its familiar blue cans red as part of a promotion in China, and Gatorade, a Pepsi brand, ran a TV ad featuring Chinese athletes counting down to the year 2008. Advertisers don't even need to have a physical presence in a host country. Nike's Web-only soccer ad featuring Brazilian star Ronaldinho was viewed millions of times in the buildup to the 2006 World Cup, despite the fact that Nike wasn't an official sponsor  its rival Adidas was. "The world has moved on" since Nike plastered Atlanta with its billboards, says Charlie Brooks, Nike's head of communications in Europe. The fact that so many consumers are now digitally enabled means "trying to create things that are going to be shared," he says. "There's no barrier to that." For Kulula, having to yank its soccer-themed spot was probably not a big blow. The resulting hubbub in South Africa gave the airline far more publicity than the single-page ad ever would have. In a revised version, published in early March, the soccer balls had morphed into other sports items. What were vuvuzelas  the trumpet-shaped horns popular among South African fans at soccer matches  are now golf tees. "Because there are so many more exciting reasons to travel around our country this year," the fresh ad read, "than just for that thing we wouldn't dare mention." Read "Not So Pretty in Pink: Are Girls' Toys Too Girly?" See pictures of South Africa preparing for the World Cup.